While more effective in the hands of a skilled player, this is a club with good performance characteristics, even for the average golfer. Ping engineers intersected the crown (the top-most portion of the club head) directly to the sole to create that low and wide club face, and at only 142cc, it is definitely not over-sized. There is an entire line of fairway woods in the G10 series, but we're focusing on the 5-wood here. Technical details include: 18.5 degrees of loft, outfitted with a 42.5" graphite shaft for a total swingweight of D-1. Those are all pretty middle-of-the-road numbers for a 5-wood, so no surprises there. Where the G10 5-wood really stands out is perhaps in the variety of ways you can find this club, including: both Right and Left hand orientation, Soft-R (senior), Regular, and Stiff and X-Stiff flex options for the TFC 129 proprietary shaft. Shaft upgrades include the Grafalloy ProLaunch Red (R, S, and XS) -- this option will reduce the spin rate and produce a lower, more penetrating ball flight -- a nice upgrade for the better player who doesn't struggle to get the ball airborne. 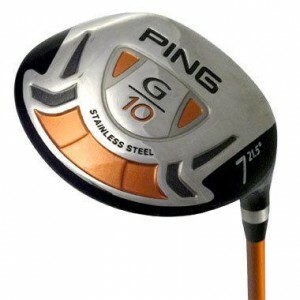 Standard grip is the Ping 703 in soft rubber. This grip is pretty standard across the line and has a "flame" pattern in the rubber that is supposed to improve both your grip on the club and the performance. For my money, it's just another rubber grip and as good as, but no better than, the next one. Ping has veered slightly from their normal look by painting the graphics on this club in copper and black -- but they make for a striking appearance and, with the color-coordinated clubhead cover, it is a good-looking club. Other fairways woods in a similar vein include the TaylorMade R9 or Nike Victory Red.